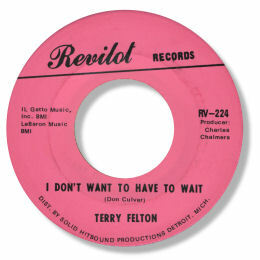 Funnily enough Terry is a woman – and even more strange is to find her singing this Memphis gem on a Detroit label. Producer Charles Chalmers had already cut the achingly soulful ballad I Don't Want To Have To Wait on Barbara & The Browns as well but on this showing Terry could give her more famous colleague a good run for her money despite being placed rather lower in the mix than I would have wished. I think the arrangement here is just a tad more imaginative than the Barbara cut on Cadet – but it’s a close run thing. Hedge your bets and enjoy both versions.